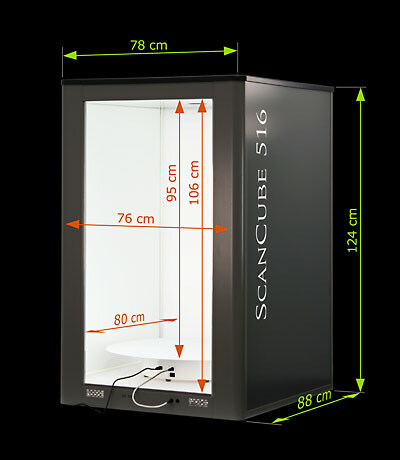 The mini studio ScanCube 516 includes a 516 photo booth, its accessories and the Easy-ScanCube software. The e-360 version includes additionally a synchronized turntable to make 360° animations and videos. * The maximum dimensions listed here for products that may be photographed in 516 photo booths are given as estimates; depending on the shape of the object, the dimensions may be bigger or smaller. For your convenience, it is recommended to allow 3 to 5 centimeters extra room. Easy-ScanCube software controls the shooting and animation processes. The program remotely pilots all of the digital camera functions with onscreen previews and reframing. Computer-controlled digital camera video mode. The six light sources' settings and gradation are completely computer-assisted, with a library of presets available. The back and the floor of the 516 photo booth are equipped with computer-assisted backlighting. This exclusive, energy-saving LED technology allows for pure white backdrops. Modulation is done by the Easy-ScanCube software and its presetting library. The incorporated color pipette allows you to verify that the background is perfectly white (r=255, g=255, b=255). The Easy-ScanCube software automatically synchronizes the turntable's motion with the shooting, with a preselected number of photos taken per rotation. It also pilots the centering tool's lighting. Photo booths are configured to allow the Easy-ScanCube software to control current and future accessories. This is, for example, the case of the laser centering tool that saves time spent placing products in the booth. Automatic generation of 2D animations in flash, with or without incorporated zoom. This kind of animation is particularly useful to present a line of products (in different colors, for example), a product with a lot of detail, or related products. Automatic generation of 360º animations in flash, gif and html5 for perfect compatibility with smartphones; with or without incorporated zoom; selection of the number of photos and animation style; customization of the animations' graphic composition. The Easy-ScanCube software pilots the digital camera's video mode and synchronizes the turntable to generate 360º product videos. These videos are immediately useable on Facebook YouTube, Vimeo, Dailymotion. 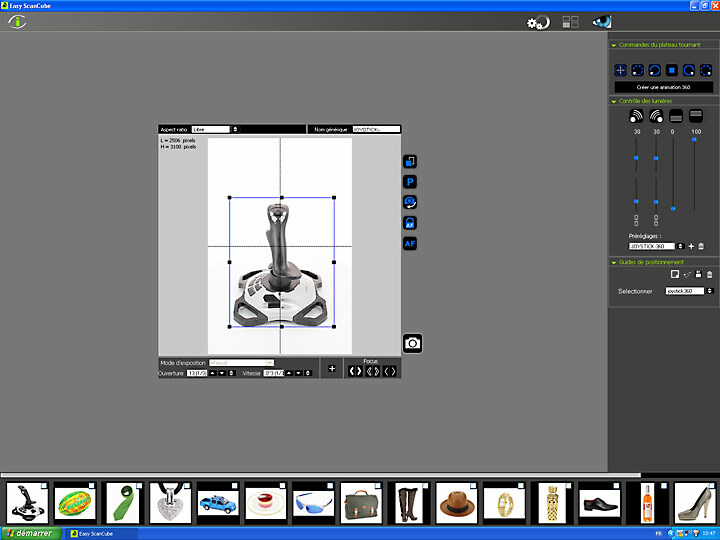 The Easy-ScanCube software's album module allows batches of photos to be treated at once (resizing, renaming, retouching), to create 2D and 3D animations from stocked photos, and organize photo files. The Easy-ScanCube software is no photo editing software but it allows to easily modify the tone of a photo (warmer, cooler), to add contrast, lighter or darker, and to correct a color. 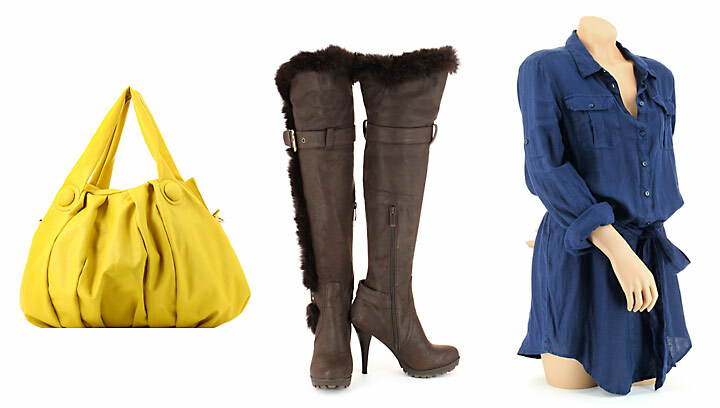 These corrections can be saved in a library to be reused later or automatically applied to future images. This function is particularly useful when making animations as it allows the user to treat each photo of a group in the same uniform, automatic and transparent way. Resize by moving the fists, with the possibility of blocking length / height proportions. Allows an object to be placed in the same exact position as previous products (possibility of creating a library of positioning references). All camera settings are controlled from the screen in auto or manual mode. Autofocus or on-screen control with Easy-ScanCube's zoom adjustment. Blocking/unblocking autofocus feature. Yes, with on-screen previews and files saved to the computer in mov format, compatible with all video content sites. For advanced users, possibility of choosing the reference white and modifying the digital camera's internal settings (contrast, chroma, sharpness). Yes; may be applied by checking off a box, with customizable placement and transparency. From Easy-ScanCube, open photos directly in any editing software such as Photoshop. Jpg, raw, gif, swf, html, mov. Automatic naming by incrementation of a pre-determined generic name, to be validated or modified after shooting. Naming function from a database. Possibility of applying an automatic correction while saving. After shooting, the preview allows one to verify the photo's quality and to test the colors and whiteness of the background with the color pipette. The comparison tool allows side-by-side comparison of 2 to 4 photos. On-screen, around the preview window. The 6 on-screen cursors allow setting the lighting intensity of each of the four direct lights (2 levels of lighting on the right and the left) and 2 backlighting sources. Select the number of photos per turntable rotation, automatic synchronization of shooting and the rotation of the turntable. On-screen control shows up the turntable's center with laser crosshairs. Yes, with saved angle settings. Choose the animation style, with the possibility of generating many successive styles, and save each photo produced for the animation as a single jpg file. Possibility to incorporate a zoom and to configure its size. The photo albums allow users to treat photos in batches (resize, duplication, correction, renaming, optimization), to generate multi-view 360º animations from stocked images, to organize photos and files. From an album the user can also generate high definition images with progressive zoom (progressive zoom speeds up image loading time). The photo correction module allows the user to modify saturation, contrast, lighting, and to change different levels and correct tone. Corrections can be saved in a library to be applied to other photos later or automatically during shooting, while being saved. Automation of multiple processes for increased productivity. Easy-ScanCube software is regularly updated with new capabilities, following technological advances and our clients' needs. The 516 photo booth is rock solid; it is made entirely out of aluminum, and durable components used in aviation technology such as aluminum honeycomb panels. The 516 photo booth is equipped in front with two 24V sockets to supply options such as the turntable or lighting elements. The upper compartment is equipped with a USB port, a 3V socket, a 24V socket and two quick attachment points to supply, pilot, and put in place current and future accessories such as: - the adjustable support for vertical shooting (optional) - the computer-piloted laser centering tool (optional) powered by continuous 3 V. - the nylon suspension thread (optional) to hold certain items in position (a bag's handle, for example). The photo booths are equipped with high quality Osram compact fluorescent lamps, with an exceptional color rendering index of 98%. The color temperature is 5400°K. 2 USB2 connectors on the back of the photo booth. The sensitive elements are grouped within a removable box, designed for easy customer care, by standard exchange. The center is marked by a lit red point, computer activated/deactivated. Acceleration / Deceleration calculated automatically depending on angles to be taken. 24 V continuous (plugged into the front side of the photo booth or possibility of plugging into a separate power source). The 360° animation turntable may be used without the photo booth. Required configuration: computer with Windows XP or Windows 7 (PC or MAC with Fusion or Parallels desktop), 2 Go of memory, 2 free USB2 ports plus a third if using the turntable, 1 high quality screen (minimum 19", or more ; minimum 900 pixel resolution in height). ScanCube 516 studio components: 1 Easy-ScanCube software, 1 516 photo booth, 1 tripod, 4 tested compact neon lamps, 1 3m USB2 cable, 1 2m extension USB2 cable,1 3m 220V power cable. ScanCube 516 e-360 studio components: 1 Easy-ScanCube software, 1 e-view360 M1 turntable, 1 516 photo booth, 1 tripod, 4 tested compact neon lamps, 2 3m USB2 cables, 1 2m extension USB2 cable, 1 3m 220V power cable, 1 24V power cable.